An attractive landscape is all about using plants with compelling foliage. That’s the key to ‘CG’ and the big reason I’ve been including it in my designs for the past three years. 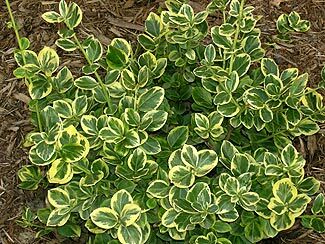 The semi-evergreen shrub features light green leaves with wide, yellow margins. The medium to small, oval leaves hang tightly to the long, arching branches. The plant can be pruned to stay tight in appearance, or allowed to spread. Mature height is 4’ tall by 3’ wide. The shrub performs well in full sun to partial shade. It isn’t particularly picky about soil, though neutral to slightly acidic soil is best. Fertilize in spring, water no more or less than average for shrubs, and it will flourish.